Nocturna is the story of Valon Wess, a kidnappee who struggles to let go of his family and the human world as he integrates into a new and dangerous society. 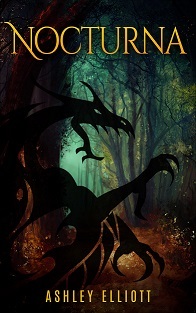 As a kingdom inhabited by creatures of myth, Nocturna has existed since before the dawn of history. Valon is unaware of this world like the rest of the humans on Earth. At least he was until he is kidnapped, joining Di and other humans on their unwilling way to Nocturna. Valon becomes the dragon King Alexei’s first male concubine in a nation where humans are slaves. With his arrival bringing many changes to the social structure of this monstrous society, Valon must learn to accept his position in this strange, ancient country as well as deal with his blossoming love for a man of a different species. Genres: YA, fantasy, LGBT romance, and ancient historical fiction. Interests: Reading, Writing, Painting (terribly), Hanging with Friends, Singing, Damn this is starting to sound like a dating site so, moving on! I can’t think of anything else to write, so message me or comment below if you’re curious about anything else.